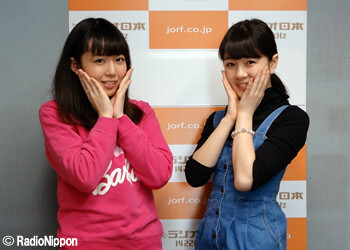 So, after my successful frantic attempts to translate all of Maro’s blog before she graduates ( 🙁 ), I will resume my frantic attempts to catch back up on radio translations, hooray! At the point of this broadcast, Setsubun, the traditional Japanese first day of spring (which is well before the actual first day of spring and well before it actually stops being cold outside), is coming up. One tradition within Setsubun is the eating of Ehou Maki, or “lucky rolls,” a rolled sushi comprised of various ingredients that are supposed to bring about good fortune. Rinapuu opens this show by asking if Kananan likes this tradition. Rinapuu: Hurry up and answer. Kananan says that she always ate them back home in Kansai, but since moving to Tokyo and Kanto, she’s noticed that they aren’t as common in this area and it’s been difficult to find them. This is sad for her, because she has fond memories of eating them with her friends and family. To maximize one’s luck with the Ehou Maki, it must be eaten facing the luckiest direction for that year (Rinapuu: “Which way is that?” Kananan: “I have no idea!”) and in silence. The silence part is what Kananan has always had most trouble with, because being around people and not being able to talk just makes her laugh. Then, as she looks around at other people’s faces, she inevitably mutters, “Somebody say something,” then immediately recoils in horror because she realizes that she just broke the silence. It’s a fun holiday for her. Because ANGERME’s first single is set to come out soon, Rinapuu encourages Kananan to talk about the songs so that everyone can learn more about them. Taiki Bansei is, of course, a Takui song that he wrote for his own album, but according to Kananan, some staff members approached him and asked if they could use the song for Ange’s purposes. He complied and rearranged it for them. Kananan tells everyone to watch MUSIC+ on YouTube to see some footage of the instrumental recording as well as footage of the members recording the chorus and other background vocals. The lyrics are also important, because they push the listener, especially those among us who are late bloomers, to keep doing their best because we only have the present. This also encourages Kananan, as it is particularly relevant to her and the reborn group. Hi, hello. My name is Lurkette (sort of) and I promise I’m not intentionally abandoning anyone. I’m just really busy. That said, I do enjoy translating and especially translating anything related to S/mileage/Ange (no I will not say their full name unless I have to, thank you), so I am going to try my best to keep up with this better. I am also a crazy completionist and I like having everything translated, but if you, the readers, would prefer I give up trying to fill in the gap between now and when I last translated, I will focus on the more recent shows instead. That goes for We Are Juice=Juice, as well. Let me know, and I’m sorry for the delay! …so go buy more clothes. As the weather warms up a little, Kananan asks Rinapuu what’s heating up for her, and the answer is sales. This is the time of year in Japan when everything goes on sale so that stores have room to add the new year’s collections, and Rinapuu is taking full advantage by buying lots of shoes and clothes, as now all the sales have gone from 30-50% off, as they started with at the beginning of the year, to 70% off. Kananan hopes that she’ll take her with next time she goes. As for Kananan, the hot new thing is lazing around at home. She used to spend all of her off days going out with friends, but lately she has taken more time to relax by herself. Kananan: I’ll just hang out on the floor, sometimes I find some cardboard and make a fort out of it and stay in that. Rinapuu: …are you a cat? In her defense, she has also taken up running and runs around her neighborhood for an hour every day, so by the time she gets back she falls asleep on the floor. End of story. … are you a cat? The opening discussion question is, “What country do you want to visit?” Kananan’s first choice is Saipan. Rinapuu does not know what that is. Instead of explaining what that is, since she probably doesn’t really know, Kananan details her plan for Saipan, in which all of the 2nd gen members go on vacation for a week in Saipan in 10 years’ time. Rinapuu wonders how old they’ll be then; Kananan says 30, but then she realizes her math is all wrong. Then, she changes when she wants to go from 10 years to 7 to 5 to 6. Basically, a year or so after they graduate from ANGERME, she wants them all to go on a trip overseas together. Rinapuu doesn’t know about Saipan or this timeline, but she agrees with wanting everyone to go on a trip or at least getting together again once they leave the group, however long that will be. Right now, even though they’d like to travel together, they never have that long of a break, and when they do have days off they spend them with their families and they aren’t all necessarily in charge of their own finances yet, so it just makes sense from a practical and an economic perspective to wait until they’re done with the group. Whether it’s 4 members or 6 or 9, they both want to have a fun trip with the group. She just wants to see the Saipanda, because who wouldn’t? This is the time of year for newly 20-year-olds and not quite 20-year-olds to dress up in their finest kimono and wander out into the cold to get a certificate confirming that they are now adults. It’s the Coming of Age Ceremony, hooray! Unfortunately, none of 2nd gen are getting to participate, and even though 1st gen should be, they aren’t, because their managers are buttheads. In any case, Kananan and Rinapuu talk about what an adult woman is to them. Kananan: Yes, yes, like me. Kananan: Mhmm, just like me. Rinapuu notes that she has this image of an adult now, but she recalls back when she was younger that anyone older than her seemed like an adult, so she thinks that even when she reaches 20 and technically becomes an adult herself, she will have a completely different idea of what it means to be grown up. Still, for right now, the primary characteristic she sees in an adult woman is her composure. Kananan is clearly already an adult woman so she doesn’t have any impressions as to what one would be. It’s the first show to be recorded in the new year, and so they go over what they did to bring in 2015. 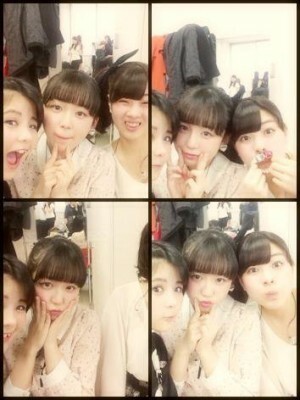 Rinapuu wrote about her big event in her blog, but she went to see the Kpop group Supernova in concert. She’s been a huge fan of theirs for a long time and really, really wanted to go see their end-of-the-year concert. However, the end of the year is a notoriously busy time for the H!P members, between the Countdown live and rehearsals for Hello!Con and everything in-between, but the concert just so happened to occur on the one day this month that she has off. 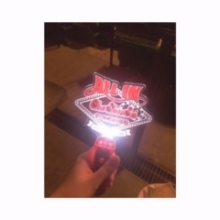 She got to buy a penlight and a t-shirt and had a great time. 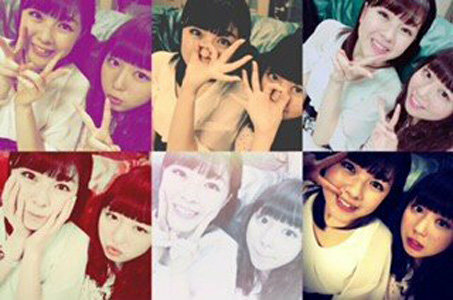 Why are Rinapuu’s blog pictures so tiny? As for Kananan, she spent her day off back home in Kansai, since they were prepping for the Countdown in Kobe and Osaka. This meant a lot to her since most of the time she’s in Tokyo, even on her days off, and she could go do New Year’s festivities with her friends from back home. She actually slept through the change between 2014 and 2015, which shocked her, but once she woke up she went to go hang out with her friends. They went to Nara together to do the first shrine visit of the year, they played with the deer, and they got to write down their wishes together. Kananan notes that this year is supposed to be an unlucky one for her, so while she didn’t get a chance to go see a Buddhist monk to perform a ritual to ease some of her future misfortune, she feels she got off to a good start. She’ll just need to be extra careful in February. The show today is opened by Kananan losing it over the way “ah~” is written in her script. After attempting to regain her composure, she asks Rinapuu about the past year, since this will be the last show of 2014. Rinapuu says that at least within the radio show nothing big happened. With everything that happened to them outside of the show, she was really glad to have some sense of stability by having this show continue as it was with no major changes. She also realized this year how noisy it gets in the studio with all 4 members, since they had quite a few shows with all of 2nd gen present, and how nice it was to have guests every so often. She would describe the show this year as “ordinary,” but in the best possible way since everything else this year was anything but. Kananan is also very grateful that nothing in the show changed. As she and the other members have said before, they didn’t really feel as though they had much of a voice or a way to promote themselves prior to this show. They had the 2nd gen blog, but Kananan felt like she was so distant from everyone and she wasn’t getting a chance to say what she really wanted to say, so she was overjoyed to get the show and then have it increase to a half-hour program. She was afraid at times this year about the show getting cancelled or about it becoming a S/mileage-general show when Maro and Ayacho made more frequent appearances, but in the end everything has stayed the same and she’s very glad that it did. Moving past the radio show and on to the year at large, Kananan asks if Rinapuu has any regrets, or Rina-grets, as Kananan calls them. Rinapuu’s first thing is not so much a regret, but an “oh well.” They were so busy this past year doing shows in live houses everywhere that she felt like there wasn’t any time to completely absorb everything. Every time she would start to think upon and appreciate what she was doing, it was already time to move on to the next thing. Her biggest regret otherwise would be that she wishes she had cherished the time she had with 6-member S/mileage just a little more. They were so surprised by the announcement that they were getting new members and it all happened so quickly that there wasn’t much time to reflect or react positively or negatively, so she would have liked to have had a bit more time with just the 6 of them and being able to bask in everything that they had accomplished together. Also, they had really never gone out together as 6, so she didn’t feel like she had enough time to process and plan something for all of them before they became 9. In any case, she’ll try to cherish this next year with 9 and make some nice memories. So, two holidays, six family trips, and one repaired computer later, I’m back from the dead and ready to hop right back in to what is still, for the time being, S/mileage Station 1422. The group has at the point in time of this show already changed their name to ANGERME, and the show name will later change to AS1422 accordingly, but I will probably refer to the group as Ange should it ever need to be said, lest I cause myself and others undue feelings of fury and rage. I will attempt to only refer to the group as S/mileage whenever the members do, which they seem to do when they are referring to events in the past that happened prior to the name change. Anyway, on with the show. Since it’s so close to Christmas, Rinapuu opens the show by asking Kananan what she wants for Christmas. After several moments of contemplating and drawing out her answer, Kananan says that she wants some books or some DVDs or something. Rinapuu thinks that that is lame and tells Kananan as such, but she really wants some clothes, not that she needs any more, she just wants them. And maybe a DVD or two (Kananan: “Hey!”). They’ll be waiting for your presents to them. Or, Santa’s presents to them. Whichever comes first. However, the impending holiday signals another important milestone: the end of the seemingly never-ending Smile Charge Tour. While Smile Charge has been a collective of a few different tours, they performed an incredible amount of shows in every single prefecture in Japan over the course of the year and it feels almost surreal to them that it might actually be over. It has been fun, though, getting to go to every single prefecture in Japan and occasionally getting the opportunity to sightsee and experience differences in the various regions of Japan. Kananan points out that she is indeed Japanese (to which Rinapuu replies, “Oh, really?”), but she didn’t realize how little she had seen of Japan until this tour, so even though it was very long and tiring to go around the country like this, she is grateful for the opportunity. There is a very brief introduction to the show by Meimi and we immediately go right into a song because we have things to do today! Out of all the requests that the 2nd gen members have been supplying to the radio station staff, one of them got her wish! But first, music. 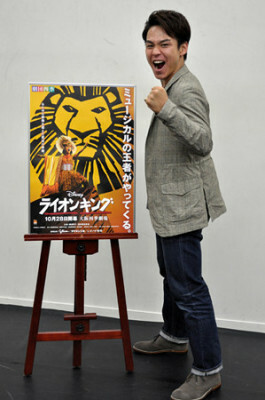 Meimi starts us out with some facts about The Lion King, the musical. I’m sure most of you could guess that it is based on the 1994 Disney film of the same name, but the musical has been in production since 1997, it is the fourth-longest running Broadway show in history and still running, and it is the highest grossing Broadway production of all time. The Japanese adaption has been running since 1998 by Gekidanshiki, Meimi’s beloved theater company. Meimi first saw the musical on a field trip and was impressed by how packed it was even having run so long, and, as a special treat, Meimi got to sit down and talk with the current actor in the role of Simba, Minami Akito! Woo! If The Lion King inside a radio broadcast booth with a Japanese pop idol sounds familiar, there’s a reason.